Prince Harry might come across as the good brother, that sweet ginger brother you never had, but it seems like he is wrapped up in a flirtatious royal affair with Prince William‘s wife, Kate Middleton. 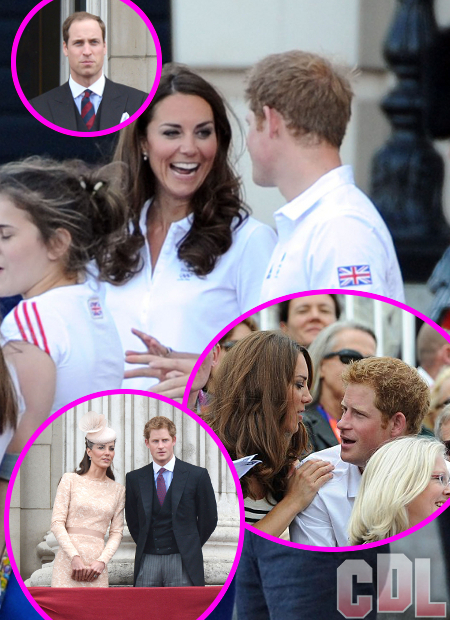 According to Now Magazine, Harry and Kate looked really intimate on the balcony of Buckingham Palace during the Queen’s Diamond Jubilee celebrations. She winked with her peasant/commoner smile and Harry laughed with a monarchical giggle. Thank the gossip gods that we’re in agreement with the friend. We doubt these two are getting their kink on like John Travolta at a male water polo match. What do you think? Are Prince William, Prince Harry, and Kate Middleton wrapped up in a super sensual love triangle? Sound off in the comments below and give us your royal opinions.